Most visitors to Granada come to explore the fascinating and beautiful Alhambra, with good justification, but you shouldn’t skip the chance to stop by Granada’s Cathedral as well. In fact, it’s most pleasant to walk through the relatively compact historic core of Granada. After the expulsion of the Moors from Granada and take-over by Spanish Christian forces, it makes sense that a new Cathedral was called for, but that did not happen right away. The war had been very expensive and other conflicts were diverting the monarch’s monies away from Granada. My wife and I spent a fun week in Andalusia with our two dear friends from Germany, Bernd and Monika, whom we’d met some years back while on safari in Botswana. We’d arranged to meet in Seville, we arriving in a rented car and they in their RV. Our first rendezvous was near Seville’s glorious Cathedral, in Barrio Santa Cruz. This neighborhood was once a busy and crowded Jewish Quarter but, as with much of Europe, few Jews remain today. 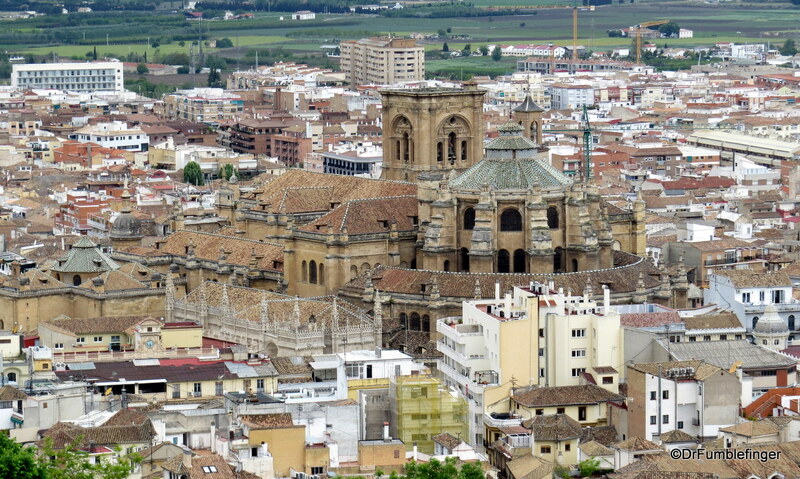 Instead, Barrio Santa Cruz has become an area popular with tourists looking to experience the “real Seville”. Paris’ Arc de Triomphe rests at the center of Place Charles de Gaulle, near the western end of the Champs-Élysées, and is at the hub of twelve radiating avenues. It is a war memorial honoring those who fought and died in the French Revolutionary and Napoleonic Wars. The monument is decorated with war scenes, symbols and the names of French victories and victorious Generals. Beneath the vault rests the Tomb of the Unknown Soldier (from World War I, interred in 1920). This grave was visited by President and Mrs Kennedy in 1961. Rumor has it that after JFK was assassinated in 1963, Jackie requested an eternal flame be placed at her husband’s grave in Arlington Cemetery because she’d liked the one under the Arc de Triomphe. Situated adjacent to the Seine in the Jardin des Tuileries, not far from the Louvre, you’ll find a wonderful museum. It’s next to the Place de la Concord and is housed in the palace’s old orange-tree growing greenhouse (orangery), a building completed in 1852. The building is lovely, with some statues outside including one by Rodin, but it’s what’s inside that’s truly special. For over 800 years the tower of Seville’s magnificent cathedral (the Giralda) stood as the tallest structure in the city, built at 103 m. Completed in 1195, it was originally the minaret of the Aljama mosque before it became the bell tower of a Christian Church. The structure took 12 years to build. The name Giralda means “she who turns” after the weather vane on top of the tower. The figure on the weather vane, called El Giraldillo, represents faith. Berlin is an interesting and fun destination. Almost completely destroyed by bombs in World War II, it is mostly a newly rebuilt city, though with some interesting preserved historic sites. Economically the city is doing well and it has a young vibe because of its college and job scene.